With less than a week before we leave for our Mexico and Belize trip, our itinerary just changed. I described the original plan in my last post about the trip, but the gist of it is that we are spending the 1st night in Playa del Carmen before heading south to where my brother lives for a few days. Then we’ll finish off the trip in Belize. Last night, 1 week before we leave, my brother called and suggested an itinerary change. He works and lives at Maya Palms in Mahahual (or Majahual). As a boutique resort, every staff person is needed on the property when they have guests. When we planned the trip a couple of months ago, there was no way of knowing if they would have guests during our stay. If they do, Mark would need to work during our visit and wouldn’t be able to leave the property. If it was empty, he would be able to get time off and join us in exploring town and go to dinner at local restaurants. Not knowing which would happen, we planned to spend 3 nights with Mark at Maya Palms and hoped they wouldn’t get any guest bookings so we could spend more time with him. Luck is with us and they don’t have anyone booked for the weekend as of today. Since Mark is able to get the entire weekend off, we are going to Chetumal instead of Mahahual so he can get a bit of a vacation too. While I’m not quite ready to head out of town with no agenda, I do believe the key to making the most of your travels is to be flexible. I usually try to plan out hotels and transportation in advance so all I have to worry about when I arrive is deciding what do each day. The itinerary below is pretty typical for the level of planning I do in advance. Where we are staying and when we will do major activities that require transportation get planned out in advance. Fine tuning the rest of the itinerary gives us something to do on the airplane or gets sorted out after we arrive at each location. Day 1 (Thursday) – Get up in the middle of the night so we can be at the airport at 4:30 AM to fly to Cancun. 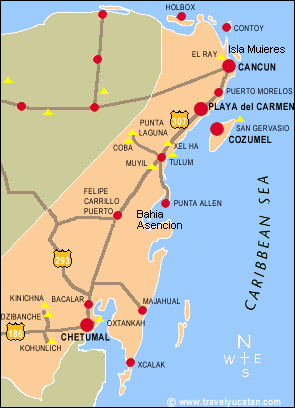 Upon arrival, go to the bus station and buy a ticket to get to Playa del Carmen. Enjoy the afternoon and evening, then try to get a good night sleep. Day 2 (Friday) – Enjoy the morning in Playa, then take an early afternoon bus to Chetumal. Arrive around 6 PM, then take a taxi to our hotel, Los Cocos, and then go find some dinner. Day 3 (Saturday) – Mark will be joining us in time for breakfast. He has been to Chetumal a number of times so we’ll let him lead the way as we explore the city. Day 4 (Sunday) – The current plan is to rent a car for the day to visit some nearby Mayan ruins and Laguna Bacalar before returning to Chetumal for the night. Day 5 (Monday) – Mark will need to head back to Mahahual on a 5:30 AM bus and we won’t be leaving for Belize until mid-afternoon, so we’ll take a little more time to see anything we missed in Chetumal. Then we’ll take a water taxi to Ambergris Caye in Belize. Day 6 (Tuesday) – spend the day enjoying Ramon’s Village Resort and exploring the island by golf cart. Day 7 (Wednesday) – take a water taxi to Belize City, then head to the local prison for a tour (I’ll explain more on this later) and to the Baboon Sanctuary, then back to the island for another night. Day 8 (Thursday) – enjoy the morning, then take a 15 minute flight between the island of Ambergris Caye and the international airport in Belize City for the flight back home.